The State of Cannabis 2018 - C.A.R.E. 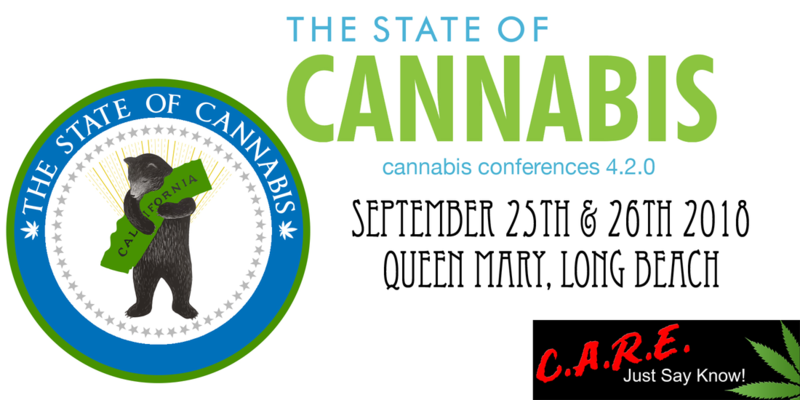 The State of Cannabis is a 2 day conference focused on elected officials, regulators, scientists, and cannabis business leaders getting together to learn from each other and affect policy in smarter ways. The year 2018 is certainly an interesting one with the release and implementation of the new permanent regulations. We have a lot to discuss! Brett Leonard, Director/Producer/Futurist "Lawnmower Man"
See a full list here and the agenda here. The conference will bring together 500-1000 of the top elected officials, regulators, scientists, investors, lawyers, and industry leaders in the California Cannabis Market for a two-day thought leadership summit discussing the State of Cannabis in California. • The State of the State - Top regulators break down the newly released regulations, where we are and where we are going. • Show Me the Money - It’s Complicated: taxes, fees, regulation red tape, paying for enforcement. Where will the market land? • City and County PatchWORK - California cities and counties can ban or set their own rules. How is a business going to navigate through the local patchwork? • High Style and the Beauty Buzz - Cannabis is HOT in the Fashion and Beauty Industry. Learn from the latest innovators. The venue is beautiful and historical. Attendees will be staying on board the ship for 48 hours of the ultimate networking experience. It’s like an urban cannabis campout!